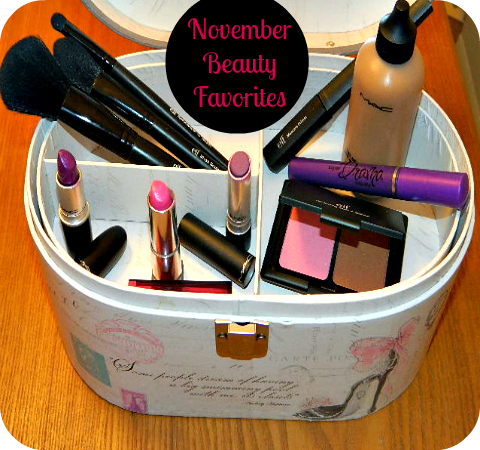 I know it has been a long time since I've shared a monthly beauty favorites post with you guys. But as I was looking at my vanity and thinking of how much I've been grabbing for certain items lately, I decided to get back in the swing of things. Here are the beauty products I've been giving the most play in November. I adore these e.l.f. Studio brushes. They're very affordable, at only $3 each, and have the softest bristles. 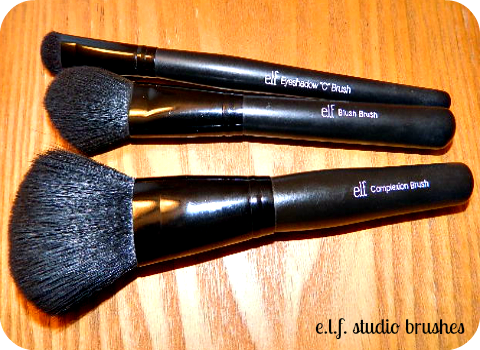 Pictured here are the Complexion Brush, Blush Brush, and the Eyeshadow "C" Brush. I typically use the Complexion Brush to apply blush and face powder. 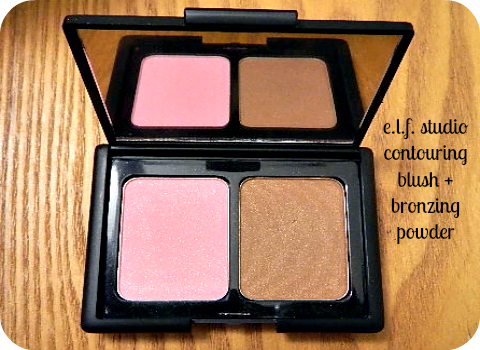 I use the Blush Brush for highlighting/contouring and setting concealer under the eye with powder. And the Eyeshadow "C" Brush is perfect for packing eyeshadow on to the eyelids. Using the e.l.f. Studio Mascara Primer has really been a dream! It helps separate my lashes and help even out my mascara application. 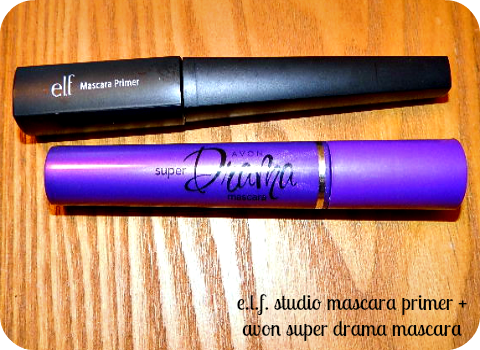 And the Avon SuperDrama Mascara does a great job of lengthening my lashes and giving them volume. I've been grabbing for both of these almost everyday! 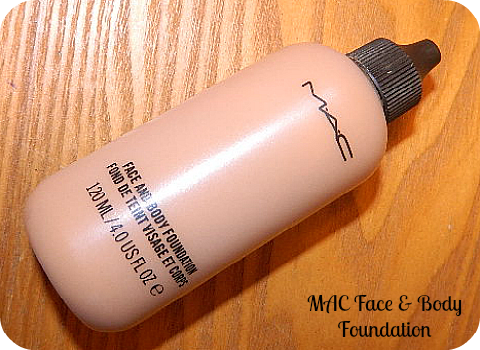 The MAC Face and Body Foundation has been my go-to foundation this month. It gives just enough coverage to buff away fading blemishes and gives my skin such a dewy glow. And though it is a bit runny coming from the bottle (as it is water-based) a little goes a long way! I love this stuff! I grabbed up this e.l.f. Studio Contouring Blush and Bronzing Powder in Antigua without even realizing that it could totally go for a NARS Angelika/Laguna Highlighting/Bronzing Blush duo dupe. The color payoff of each shade is great and the price was a steal at $3. And the blush is so bright and vibrant that I want to wear it all the time! I haven't been able to get enough of these three lipsticks this month. When MAC announced that they would be selling PRO items online, I crossed my fingers and hoped MAC Violetta Lipstick would finally be in my grasp. And as good luck would have it, it appeared on the site a night before the actual release. So you know I had to grab it up! And it was love at first sight! 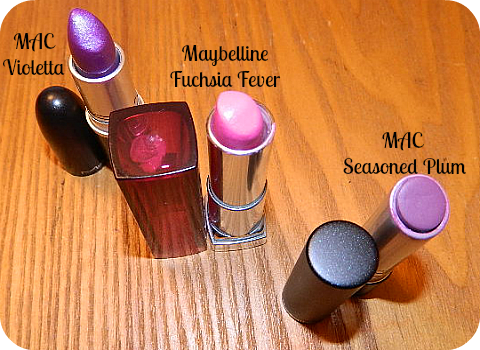 Now the Maybelline Color Sensational Lipstick in Fuchsia Fever purchase was something that happened when I was unable to get another MAC lipstick I really wanted. Candy Yum-Yum was released a second time and still sold out before I could get my hands on it. So when I looked high and low for a similar shade, I met this darling lippie. And again, lipstick love fell all over me. The MAC Pro Longwear Lipcreme in Seasoned Plum was listed here in my Fall Starting Five Lipstick post. The lipstick is so long lasting and has really been giving me life as far as my plum lipstick obsession goes.